Everyone who starts a business has hopes of becoming the next big thing. But only some have what it takes. With Enloop, aspiring entrepreneurs can now evaluate the likelihood of their company succeeding before they quit their day job. Enter your concept, your financial resources and other details about the company you want to create, and Enloop automatically generates a business plan for you, and uses a predictive scoring algorithim to calculate financial forecasts and scores measuring your potential success compared with industry peers. Enloop also provides professional guidance at every step of the way, from idea development to execution. 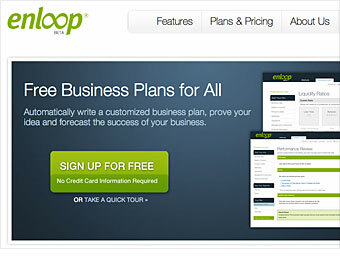 It's free to create a business plan and receive your score, but multiple business plans will cost $9.95 a month and up.